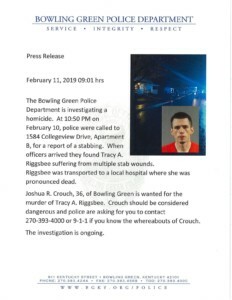 BOWLING GREEN, Ky. – Prior to being stabbed to death Sunday night, Tracy Riggsbee and Joshua Crouch had been arguing all day, according to Crouch’s uncle Ricky Miller. Miller had allowed his nephew and Riggsbee to spend the night with him at his 1584-B Collegeview Drive apartment. “An argument broke out and the next thing I know she come running out and said ‘I’ve been stabbed,'” Miller said. Crouch and Riggsbee were in the bedroom just prior to the stabbing, Miller said. The police have not yet captured Crouch, according to a release from the Bowling Green Police Department. “He fleed on foot,” Miller said. Miler was laying on the couch in another room when the incident occurred. “She come running out saying ‘oh he’s killed me,'” Miller said. Miller recalled Riggsbee having two stab wounds to the chest, he said. Police were called at 10:50 p.m. to the home, according to the release. When officers arrived they found Riggsbee who had multiple stab wounds. She was taken to a local hospital where she was pronounced dead. Police are looking for Crouch in Riggsbee’s death, according to the release. 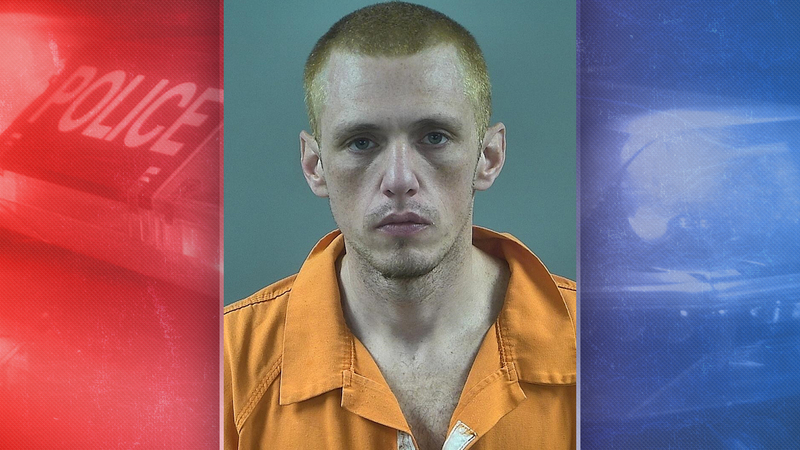 A warrant for murder-domestic violence has been issued for Crouch. 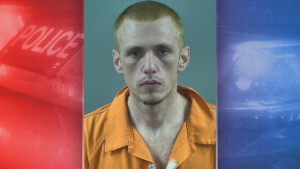 UPDATE: Crouch is now back in the Warren County Regional Jail, being held on a $1 million bond.